Toll Free: 1 800 - 663 - 0650. 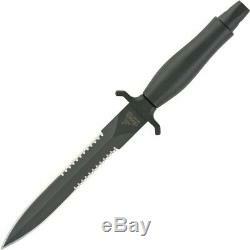 Gerber Mark II Fixed Blade Dagger Knife (6.5 Black Serr) 1874. First introduced in 1966, this combat knife has stood the test of time. Specifically designed for combat applications, the black oxide coated 420HC blade is double serrated. A die cast aluminum handle and and well-placed bolsters give secure grip. Blade Steel: 420HC Stainless Steel. Handle Material: Die Cast Aluminum. Black oxide coated blade combats corrosion and diminishes reflection. Die cast aluminum handle is sturdy in hand for combat and survival applications. Double serrated blade offers unbeatable function for piercing, can also act as a spear. Rural or remote areas may take longer than approximations. The item "Gerber Mark II Fixed Blade Dagger Knife (6.5 Black Serr) 1874" is in sale since Friday, March 8, 2019. This item is in the category "Collectibles\Knives, Swords & Blades\Collectible Fixed Blade Knives\Modern Fixed Blade\Factory Manufactured".